If a big horn is a king, then a little horn is a ______. Who is the little horn in Daniel 7:8? Well we are given a clue to his identity in Daniel 8:9. The little horn in Daniel 7:8 isn’t the same person as the little horn in Daniel 8:9, but they do have similarities. At the time it was written Daniel 8:9 was about events in the future. Those events were fulfilled during the time of the Grecian Empire. Looking back we can see who the little horn was and we can know a little about him. We know that a Grecian prince named Antiochus Epiphanies manipulated his way onto the throne of the Seleucid dynasty. The Seleucid dynasty was one fourth of the Grecian empire headquartered in Syria. Prince Antiochus Epiphanies became king. Antiochus Epiphanies was the little horn in Daniel 8:9. The little horn in Daniel 7:8 is also a prince who will become king of the final gentile world empire. The final gentile world empire is also known as the New World Order. It will be in power during the 7 year tribulation period. 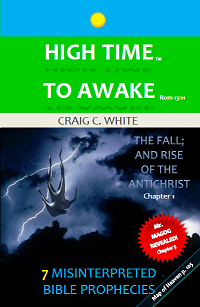 The tribulation period happens after the Rapture of the church. What is a little horn? Horns commonly represent kings in bible prophecy. A little horn is a secondary leader, for instance a prince, vice-president, or governor. This little horn will evidently take away or usurp the authority of three out of ten kings of the final gentile world empire. He will then be the ultimate authority of this world empire. This little horn has a mouth speaking great things. He blasphemes God, showing himself that he is God (Daniel 11:36-37). This little horn is obviously the Antichrist (1 John 2:18). By the way, the Antichrist will do many of the same things that Antiochus Epiphanies did. Read The Leopard is Upon Us!